Lingoport provides products and services which help our clients meet internationalization and ongoing localization challenges relating to software development and active globalization. Software internationalization (i18n) consulting services are far ranging, including i18n assessments, requirements, project planning, architecture, small and large scale implementation efforts, testing, documentation, training and more. We have over a decade of successful implementation experience on wide ranging technologies and application domains. Lingoport products are incorporated into our services engagements, making for repeatable and scalable results. We can support internationalization during your concurrent development efforts and help you meet release date demands. Globalyzer – Supports individuals and entire development teams in finding, fixing and maintaining internationalization issues in code in a broad list of programming languages (More information at Lingoport.com/Globalyzer). Lingoport Resource Manager – Provides simplified resource file management, verification and translation updating, helping development and localization teams keep up with initial and ongoing application interface resources, their translation and automated re-insertion into product builds (More information at Lingoport.com/LRM). 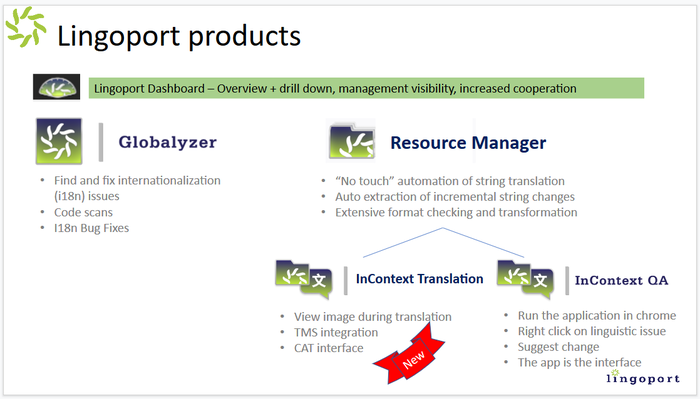 InContext Translation - The translator can see the context of strings in the translation management system (TMS) or computer assisted translation (CAT) system. InContext QA - Enables reviewers to verify translations in their context and make improvement suggestions. Dashboard: The hub of our suite. See it all, drill down, create notifications and manage the process. Bridge gaps between localization & development. 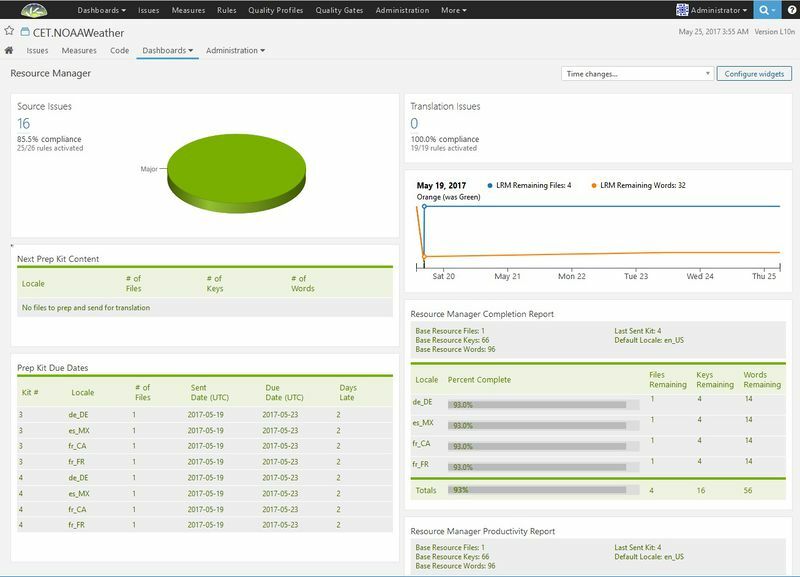 Increase visibility and track globalization metrics. IDE (Integrated Developement Enviroment) Integration: Developers can identify and fix globalization and localization issues in real time. Together with the products and assorted specialized applications, Lingoport enables continuous tracking and updates to the internationalization and localization status of software products. Automatically find and manage internationalization issues and localization changes in your source code and repositories for a wide variety of programming languages. Integrate with translation management systems and localization vendors for rapid globalization development, testing and deployment. Verify translations in an effient, process-driven manner. Works behind your firewall keeping your source code secure. Here is an example of the Lingoport Dashboard. This is the Dashboard Home page which shows several Lingoport Projects defined. For the project CET.NOAAWeather, there are 144 Globalyzer Issues, it is 97.7% complete. The project uses LRM and is 93.0% completely translated. If CET.NOAAWeather is selected, we open a more detailed overview of the Lingoport Suite functions. Notice at the top of this screen that it says that it is the Lingoport Overview. This shows the summary of the Globalyzer Scan and the Resource Manager (LRM) status. This shows that the Globalyzer Scan looked at 110 files in 22 directories for a total of 8027 lines. The Globalyzer Issues that were identified were Concatenations and Locale Sensitive Methods. 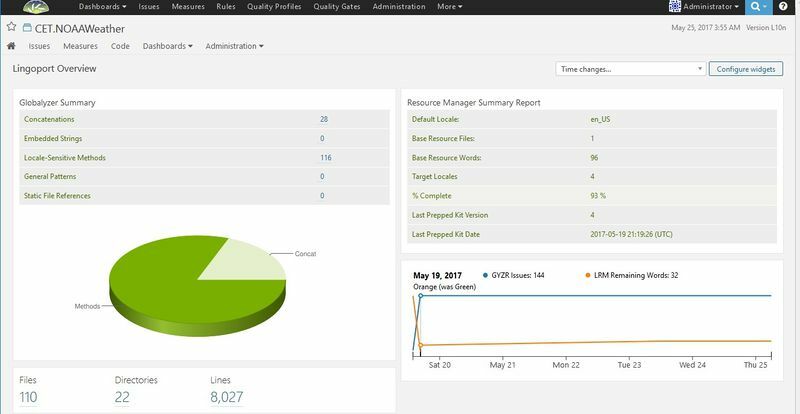 The Resource Manager (LRM) shows 1 Base Resource File to be translated into 4 Target Locales and it is 93% Complete. From the Dashboards pulldown under the CET.NOAAWeather project name, I can get more detail about the Globalyzer and LRM status. This screen shows the details for the Resource Manager (LRM) status for project CET.NOAAWeather. Notice the Resource Manager Completion Report in the lower right side. This shows the 4 locales and each of them are 93% completely translated. There is 1 file with 4 keys and 14 words that need to be translated for each locale. The Next Prep Kit Content, there are no new files to send to translation. This indicates that the base resource file has not changed since the last kit. In Prep Kit Due Dates, there are two prep kits (number 3 and 4) that are outstanding. The prep kits are at the translation vendor and they are 2 days late returning. The Globalyzer screen shows more of the details of the Globalyzer Scans. For this example, looking at the Globalyzer Scans at the bottom left of the screen, we see that only one scan was done. It was a scan named java based on the Rule Set named java05182016 which found 144 issues in 6154 lines and 65 files. These issues are identified as Major, Critical or Minor in the Globalyzer Issues pie chart. If Issues is selected under CET.NOAAWeather, more detail of the identified issues can be seen. The Issues page shows all the selected issues. In this case, it is showing 160 issues, all of the Globalyzer (144) and LRM (16) issues. For the issue at the top of the screen, the file ImageTask.java has a Locale Sensitive Method issue with the use of the java.lang.String method toLowerCase. Selecting the file will show the issue in the code. Lingoport's Globalyzer scans source code for internationalization issues. It uses sets of regular expression based rules ('rule sets') on tokens found by lexers/parsers to detect these issues and to filter false positives. These rule sets are synced and stored on a single server, and may be downloaded onto numerous client applications which perform the source code scans. Please note that the rule sets are only lists of regular expressions, and do not contain any code. Client applications include an IDE tool ("Globalyzer in IDE"), a desktop client ("Globalyzer Workbench"), command line clients ("Globalyzer CLI" and "Globalyzer Lite"), and an API that may be used to construct custom programs including Globalyzer code scanning functionality. Client applications may produce scan results in XML, CSV, HTML and Excel formats. Results are also consumed by the Lingoport Dashboard to be analyzed and displayed. The desktop client may also be used to view the results directly. It may be used to scan files that developers are working on, and will display the scan results in the IDEs console output window. Globalyzer Server - allows development teams around the world to share and collaborate together using high powered internationalization rule sets during scanning of code. Development Teams can set up their own server, or use Lingoport's Globalyzer Server to set up users and rule sets. Globalyzer Lite in IDE - It is ideal for scanning code for internationalization issues on the fly and generating corresponding reports. It does not require an external database. Globalyzer Lite parses and executes Globalyzer Lite Project Definition XML files. Globalyzer Lite in IDE can be incorporated into developers' IDE platforms for a true continuous improvement and development system. Globalyzer Workbench - provides a fully functional code analysis and editing environment for finding, fixing, testing and reporting on internationalization issues in a wide variety of programming languages. Globalyzer Workbench runs as a stand-alone desktop editor in an Eclipse Environment. Creates the Project Definition XML files. Sets up the Machine Learning environment. Updates Rule Sets on the server and exports them to the local clients. Creates the resource files to be used by LRM. Globalyzer Command Line - create automated Globalyzer scans as part of your continuous integration so that you can report and track internationalization issues over time. There is also a Globalyzer Ant Client, Maven Client and XSL Client. Globalyzer API - allows you to create Globalyzer projects and scans, execute scans, and generate reports from a Java program. The Lingoport Resource Manager (LRM) manages resource files, which contain application text as key-value pairs (the keys are used in the application to retrieve the associated text). Resource files are typically translated across languages as part of the localization process. LRM is used to determine the translation status of these resource files using a MySQL database. It also automates the process of sending text out to translation vendors when changes are made to be base (usually English) application text. LRM is often used in Jenkins scripts to automate translation. LRM also performs various checks regarding the resource files. These checks include confirmation of file integrity, detection of duplicate or missing keys, and numerous other validations. When a translation vendor returns translated text for these resource files, LRM will detect the new content and perform its validations. If the validations pass then LRM will merge the new translations into appropriate resource files and check these in to source control. The check-in is typically done on a dedicated localization branch. Used by translators, resource files are instrumented as they are sent to translation management systems so that they can see the string in the application and its context in order to translate more effectively. The translation reviewer can easily select instrumented resources in an application, identify poor translations, and give suggestions for making improvements. InContext QA greatly improves the translation quality assurance process and can be a vital part of the continuous improvement environment. The Lingoport Dashboard displays the internationalization and localization status of software projects. 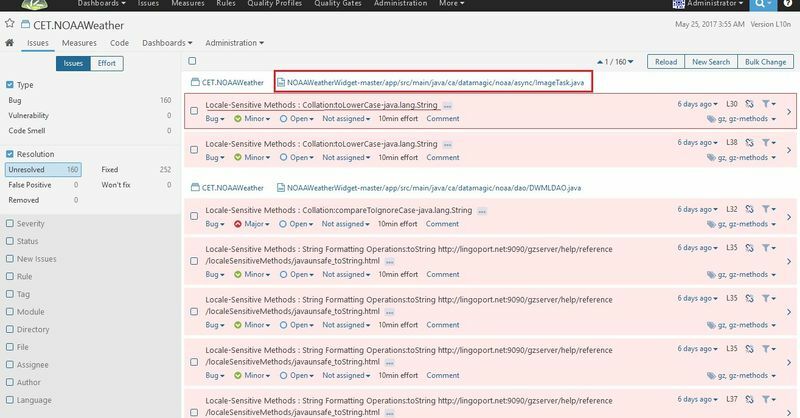 The Lingoport Dashboard scans source code and reads in XML reports generated by Globalyzer and the Lingoport Resource Manager (LRM). 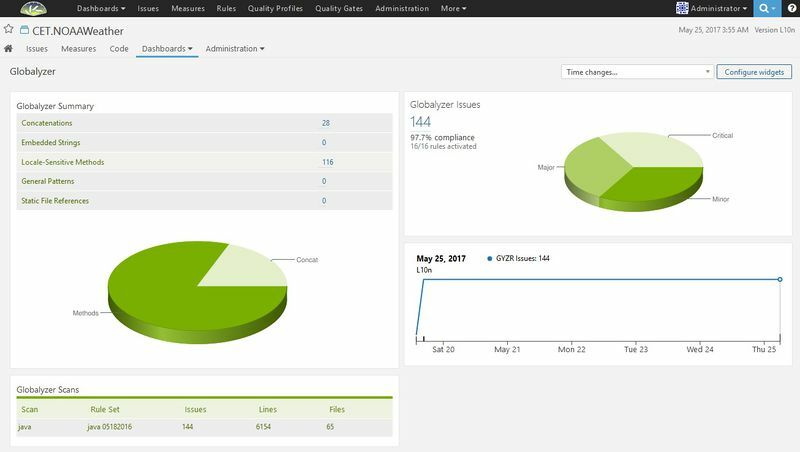 It then sends the information to the web server built on the SonarQube platform and displays the information in an easy to digest fashion. This information includes all detected internationalization issues, which may be viewed in source code - with the affected line(s) highlighted. The translation status, translation history, and current translation efforts for projects are also displayed. The Lingoport Stack Installer and the Stack Updater are automated tools to install, or update, and configure the Continuous Globalization System and the Lingoport Dashboard Server and Client. They install and configure prerequisite software programs and then install, or update, LRM, Globalyzer client, and Lingoport Dashboard. This page was last edited on 5 April 2019, at 12:09.